There are many ways we should do to increase our Page Rank blog, among others, Link Exchange or banner link, visited each other to blog buddy (blogwalking) but do not forget to make a posting in the comment column, because if we leave comments in the Shoutbox or the like, Google is less likely or not at all indeksed. And there was also one of the facilities provided to users by Google's servers to improve blogspot Page Rank, the Followers. As we know have not some of this old column Followers appearance has changed, and in the lower right corner you can see there are any posts Google Friend Connect. That means that Google now also consider the field to increase your blog's Page Rank. But we also must know that, Google also considers the link from the Followers, so proud to be first if your case Followers column of hundreds or thousands of Followers, but you do not make the link with your Followers. 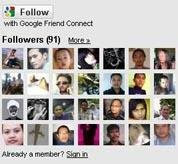 Would that make you also link with the Followers in a blog buddy who has become Followers in your blog. Blogspot server for users who have not yet installed in the field Followes blog, from now on you please attach to increase your Page Rank. I would like to help the bloggers who do not understand Followers to install the column in your blog, so please follow the steps below. Click Add a Gadget. Please select the appropriate strategic placement of your taste, in the Header, in the Sidebar or the Footer. Hopefully by adding this column Followers PageRank triumphant return. please try it out. BUKU PANDUAN LENGKAP CARA CEPAT HAMIL, Untuk Pemesanan Klik Banner di Bawah Ini!! Buku Panduan Lengkap Cara Cepat Hamil ini resmi diterbitkan oleh penerbitan online Digi Pustaka dan hingga saat ini sudah naik cetak sebanyak 5 kali Bonus KONSULTASI GRATIS. Kang, kok jadi bahasa Inggris..
bikin dong artikel tentang gimana mengubah tampilan GFC ini? I do not use the google connect as it shares facebook. Thank you for the information in any event! Yes we all hope can be like that, oks? Komen lagi, tapi beda ID.. blog utama saya ini teu pake followers kang, yaa habisnya signal pakai IndosatM2 yang super lemot, kadang2 membuka blog dengan followers yang ditampakkan, loadingnya gak selesai2. keren infonya. Makasih, aku follow ya? Info yang bagus Kang,...tapi kenapa ya, kalau Follower di munculkan atau di tampakan loadingnya agak sedikit berat, mungkin kang apih punya solusinya biar agak enteng dikit gitu ? Thanks sudah berkunjung Kang, sukses selalu ya. informasi yang sangat bagus kang Apih, saya ngikut ngefollow blog ini Kang. Nice post, wrote something similar yesterday. Noticed my earnings went up, so I am assuming it has to do with my page rank? More followers higher pager rank higher eCPM.